When we would get takeaways in Edinburgh, they always came with your choice of Pulao Rice or Naan. We always went with the Naan, since we could make the rice ourselves. You can't make Naan at home. Really. We've tried, and it always came out terribly. Ask yourself this question: Do you have a Tandoor Oven? If the answer is no, don't try to make Naan. And if your local grocery store sells something labeled as Naan, don't buy it. It won't be good. Trust me. So what to do? We just use tortillas. Sure, its not as good as Naan, but a good tortilla is better than a bad Naan. 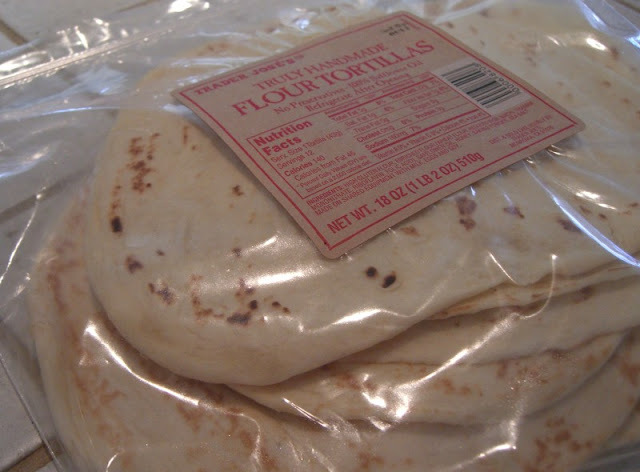 We use Trader Joe's "hand made" tortillas. They are nice and thick and have a flatbread-like consistency. 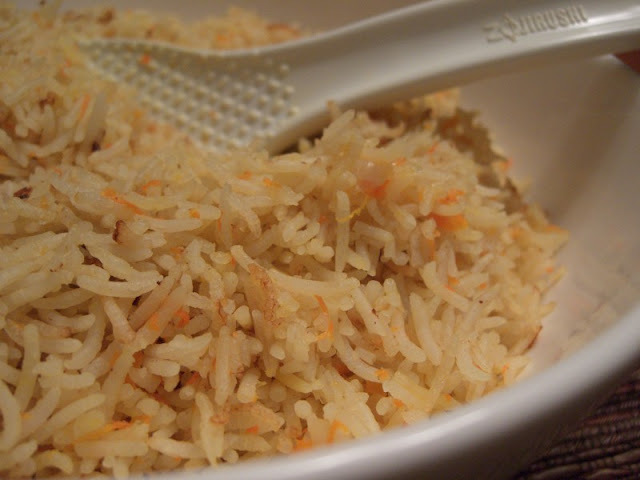 A pulao is simply a flavored rice. Ours uses sauteed onions, a pinch of cumin, a couple of split green cardamom and a bay leaf. Finely shredded and sauteed carrot contributes both sweetness and a lovely yellow col0r. When we created this recipe we cooked rice on the stove top. But now, I love using my "neuro fuzzy" rice cooker (it is made by Zojirushi). Mike gave it to me as a gift a couple years ago - I'd always said "rice is easy, why do I need a rice cooker?" Now I know. It rocks! Early in the evening we mix the aromatics with rinsed basmati rice, salt and chicken broth and let it go until it beeps (no need to keep tabs on it or watch the steam). Then, we fluff and let it keep warm until we're ready to eat. Serve it with our recipes for Chicken Pathia or Lamb Rogan Josh. This is the rice we have with curries. 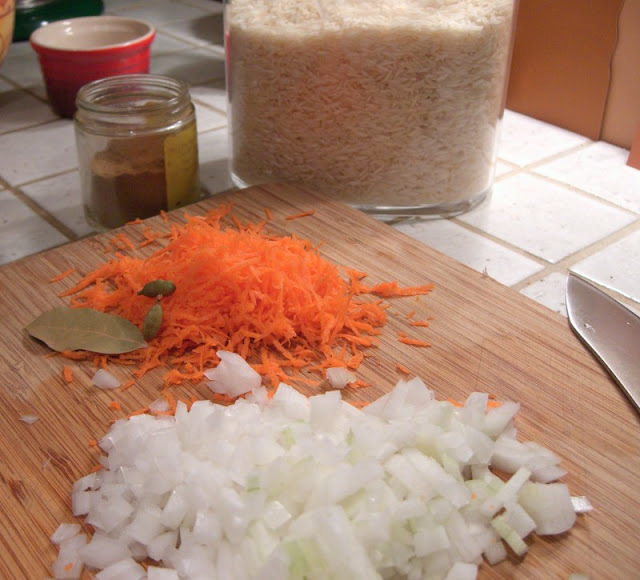 The amounts are quite variable – if you use less rice, reduce the onion, etc. Using standard methods, it can be made up to 45 minutes before eating. Using a rice cooker, it can be made up to several hours before eating. In a small fry pan, heat oil and add onion and cumin — sauté. Press cardamom pod with the side of a knife to open the tip slightly and add it to the pan. 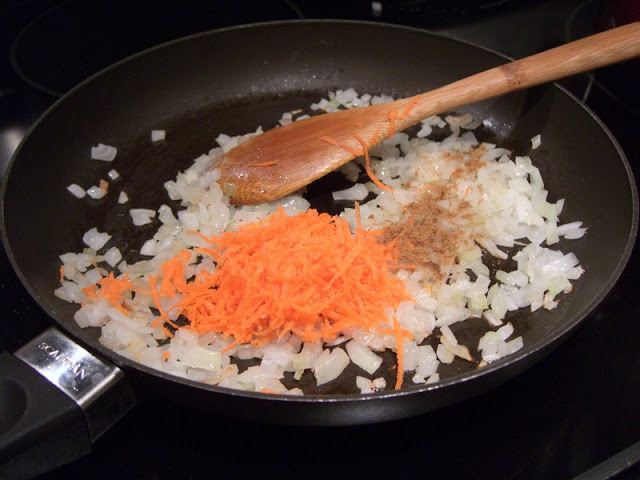 When onion is soft (about 5 minutes) stir in half of the carrot and cook another minute. Remove from heat. In the rice cooker bowl, wash rice three (yes three) times. Do this by running cold water into the pan, swirling it with the rice, and then draining the cloudy water away. Add broth to the appropiate "cup" measurement line for your rice cooker (about 1 1/2 cups of broth). 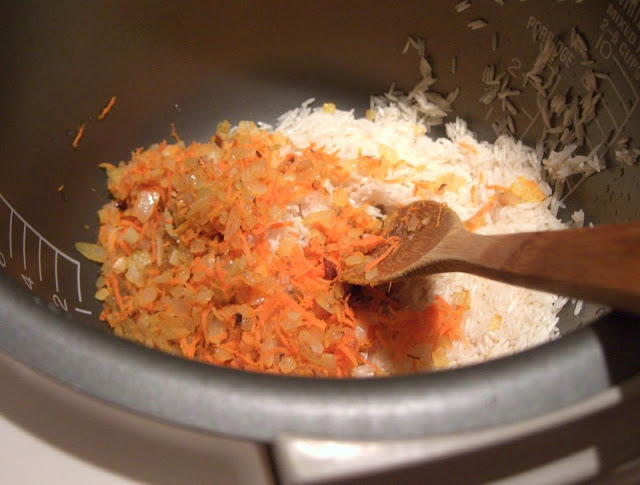 Dump onion mixture, plus extra carrot and bay leaf into the rice. Add salt, stir to mix and start the rice cooker. When the rice cooker beeps, fluff the rice. Remove bay leaf and cardamom when you are ready to eat. After posting our rant on how you can't make Naan at home, I came across this video. Love your site and am eager to try this rice recipe. Any special instructions for non-rice cooker preparation? Hi m - Cooking this rice on the stove top is pretty straight forward. Follow the recipe steps but use a lidded saucepan in place of "the rice cooker bowl." Use enough chicken broth to cover the rice by about a centimeter (or a fingernail's depth over the rice). Instead of "start the rice cooker," cover the pan, put on high heat and watch closely - when the water boils rapidly, move the pan to a burner at very low heat. Let it do its thing for 20 - 25 minutes, then fluff and serve. I hope this helps! I ate some pulao rice that had cloves, cashews, yellow raisins...it was fairly "plain," but delicious. Anyone have a recipe. I know there were cardamom pods used to season the basmati rice. Add cinnamon sticks, more green cardamom, bay leaves and cloves, fry for a bit, add turmeric, then fry the rice in the pan. Then either cook the rice in the pan if you have a lid that fits, using the absorbtion methopd, or transfer to rice cooker. Stir once before cooking to mix the turmeric in. Been wanting to try these for a while. Last night I made the pulao rice, rogan josh and chicken pathia. The curries were great - I'm really impressed with how you reverse engineered them, and the flavors are great. Also, I haven't been rinsing my rice for awhile, and forget how much better the results can be. Made the chicken dhansak tonight. p.s., where do you get green cardamom pods? Indian grocery? I ended up using just a small amount of ground dried brown cardamom. Hi Android - Wow, you've been busy cooking! Glad you enjoyed the curries. Yes, you can usually find whole green cardamom at Indian grocery stores. I have also purchased them online from Penzeys (which is where I get nearly all of my spices). I've made Naan Bread once at home, since I wouldn't be able to get the amazing charred bits on the Naan in an oven I brushed the dough with oil and put it on the barbecue. It was done in about 2 minutes. Almost perfect. Racer 5 IPA, Bear Republic Brewing Co.